Why a Ship's Wheel? 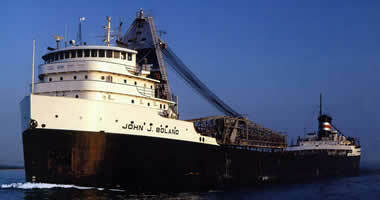 - Boland Insurance Agency, Inc.
Why a ships wheel for a logo? There are two interesting stories about the ships wheel, unfortunately I don’t know which one is accurate and will probably never know, so choose the one you like the best. The wheel came from a ship that was insured by my Grandfather. The ship sunk off of Ludington Michigan and it was one of the few items salvaged. Thus the broken handle. I know for a fact that my Great Uncle, Patrick H Boland, was the first person to pilot a ship through the then new Sturgeon Bay ship canal. As a memento to the occasion he was given the wheel from the ship. The broken handle would have been from being dropped. Over the years the wheel has hung in many prominent businesses and homes and now resides in my home.